Impress your guests this holiday season! 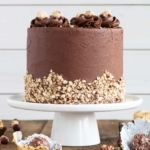 Take a classic holiday treat to the next level with this Ferrero Rocher Cake! Can you believe it’s already November?? I honestly can’t. These past few months (and this year in general) have gone by crazy fast! They say time goes faster as you get older, and I didn’t really believe it until I got older. It was my birthday this past week, and I celebrated entering the last year of my 30’s, which is crazy to me. Next year I’ll be 40. 40! What in the hell?! I’m not sure if I’ve quite come to terms with that. Ryan insisted that I *needed* to have cake on my birthday seeing as how I’m a cake baker and all, and that it would be sacrilege not to. Would it shock you to know that cake is actually the last thing I wanted? On my actual birthday day, I wanted nothing to do with cakes or baking or blogging. I think this is a reasonable expectation. I wanted a break from my day-to-day. So for that actual day, I got my hair done, did some shopping, went out to a fabulous dinner, and had PIE for dessert (cue gasps). It was a damn good pie, too. Alas, I could not let a birthday go by without baking an actual cake, this was true. So, for my birthday weekend festivities I pulled out all the stops for this Ferrero Rocher Cake! Perhaps this is my way of jumping the gun a bit on holiday baking. I know you can technically get Ferrero’s year round, but to me they are a holiday treat. Maybe it’s because of the commercials they always bust out during the holiday season. And it’s kind of a tradition these days that my parents always get Ryan a box of Ferrero’s for Christmas. It’s really cute actually. Despite my many Nutella recipes, I’m actually not a huge fan of Nutella on its own. I used to eat it straight out of the jar with a spoon when I was younger, so maybe I just got sick of it. In a Ferrero though? Heaven. With this Ferrero Rocher Cake, I wanted to make sure all the elements of a true Ferrero shone through. It is packed with chocolate and hazelnut flavour. There is hazelnut flour in the cake itself (optional, but it adds flavour and texture) and I added a layer of crunchy hazelnut meringue to emulate that crunchy shell that Ferrero’s have. I initially planned to use feuilletine flakes to add the crunch, but I opted for something a little more elaborate and went with the meringue instead. The meringue will lose some of its crunch the longer it sits with the buttercream though, so you can choose to use the flakes instead if you have them on hand. 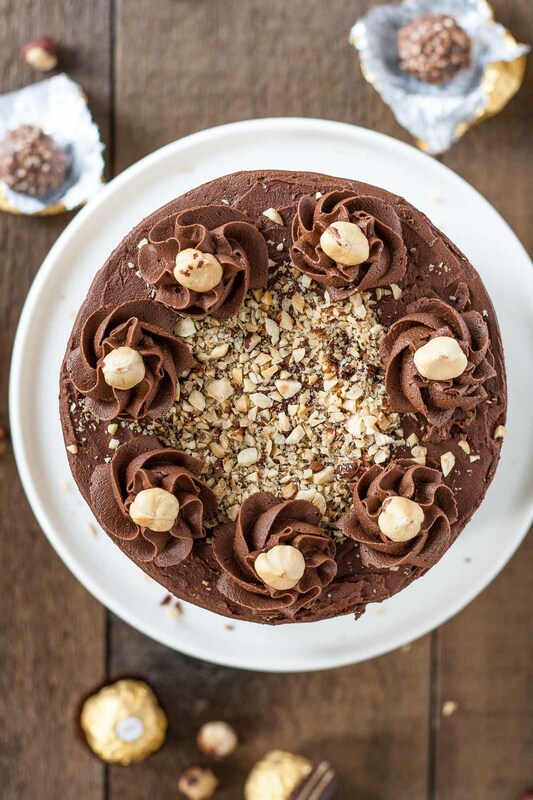 Now the rich Nutella buttercream is something I would happily eat with a spoon. It is SO good. A fluffier version of Nutella that pairs really well with the dense chocolate cake. The cake is fudgy and delicious. 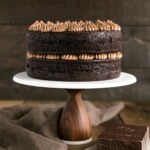 Paired with a smooth Nutella buttercream and crunchy chocolate hazelnut meringue, it’s really the best thing ever. I may have gone a little heavy handed on the frosting between the layers, but I told you it was good!! You can’t totally see the hazelnut meringue layer, but I swear it’s there! And it’s delicious. 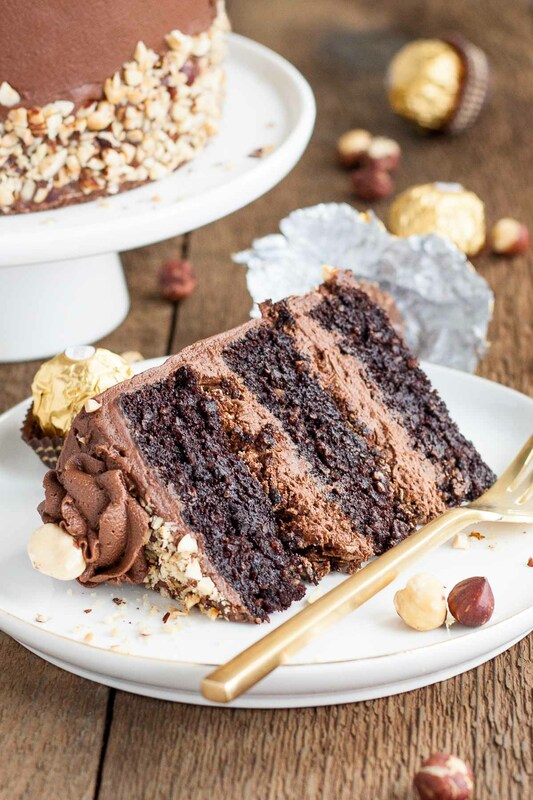 If you’re looking for something unique this holiday season, or really any time of year, this Ferrero Rocher Cake is sure to wow! If you don’t have hazelnut flour on hand and/or don’t want to make any, you can just substitute in additional all-purpose flour. To enhance the chocolate flavour of the cake, you can use strong hot coffee instead of hot water. The hazelnut meringue will soften the longer it sits in the cake. Ideally serve same day. Regardless though, it will still taste delicious! 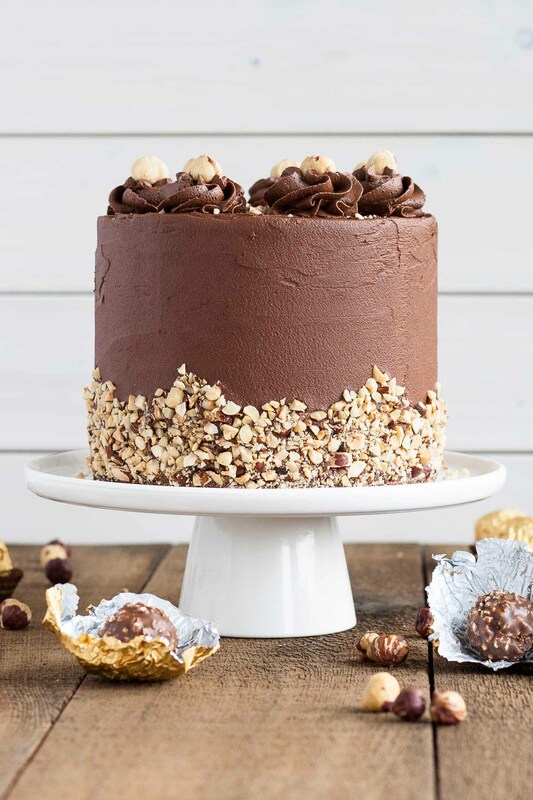 Impress your guests this holiday season and take a classic holiday treat to the next level with this Ferrero Rocher Cake! In a medium bowl whisk all wet ingredients (pour hot water in slowly while whisking as not to cook the eggs). Bake until a cake tester comes out mostly clean, a total of 30-35mins. Prepare a stand mixer with a whisk attachment and whip butter until creamy (2 mins). In a medium bowl, whisk together sifted powdered sugar and cocoa powder. Reduce speed to low and add in powdered sugar mixture 1 cup at a time until well blended. Scrape down sides of bowl and whisk as needed. Add in Nutella and whip on high for approximately 5 mins. Preheat oven to 250F and line a 10x15" pan with parchment. Trace two 5" circles onto the parchment, flip over so the traced side is down. Combine egg whites, salt, and cream of tartar in the bowl of a stand mixer**. Beat on high until soft peaks form. Slowly add sugar (1 Tbsp at a time) and beat until stiff peaks. Dab a bit of meringue under the corners of the parchment to secure it. Fold chopped hazelnuts and cocoa powder into the meringue. Pipe into discs using the 5" circles as a guide. Pipe or spread remaining meringue in empty spaces on the parchment. Bake for 90mins and cool on pan. Place one layer of the cake onto a cake stand or serving plate. Top with 2/3 cup of buttercream and spread evenly. Place one meringue disc on top and top with additional buttercream if desired. Repeat with remaining layers and crumb coat the cake. Chill for 20mins. Frost the cake with the remaining buttercream, smooth the sides and chill for 20mins. Press chopped hazelnuts into the sides and top with rosettes if desired. * Grind up 1 cup toasted, skinned hazelnuts to a fine powder. Or sub in 3/4 cup all-purpose flour. Hi Liv! How long before the meringues start to lose their crunch in the cake? I really don’t want to have to omit the meringue, yet I really don’t want a soggy meringue layer either! My last resort will be to make a hazelnut praline to replace the meringues with. Thanks! Hi Jessica! They will go soft quite quickly, but the texture from the nuts will still be there and they will have a different texture to the cake still. It won’t be soggy, just softer and almost mousse-like. But the praline will work too!! Made this cake on the weekend – it was absolutely perfect! The meringue is an absolute must! Thank you for this amazing recipe! Hi Christine! The meringue is my fave part — so glad you liked it! hello there, im planning on making this cake for my girlfriends birthday. just one question. how on earth did you decorate the hazelnut bottom in the shape you did. did you hand place each hazelnut piece or use a stencil? Hi Andrew! That is so sweet of you! I hope she loves it. I didn’t do either actually. I had my cake on a cake board and placed it on top of an upside down bowl (so the sides of the cake kinda overhang, if that makes sense). Then I would grab handfuls of chopped hazelnuts and press them into the bottom of the cake in a bit of a pattern. It was actually unintentional. One of my presses went higher than I planned so I just went with it. I probably placed some of the top of the peaks by hand though. Sometimes I make and decorate cakes a week in advance and put them in the freezer. Can I do that with this cake? My biggest concern is how the meringue layers in the cake will hold up. Hi Linda! The meringue layers will go quite soft even after a few hours, but the crunch from the hazelnuts will still be there! Hi! will the hazelnut cakes be ok to freeze for a week before assembling with buttercream? Hi Jules! Yes, that should be fine! Thank you! baked this cake for my grandmothers 88th birthday! everyone loved it. I used 2 x 9 inch springform pans and doubled the recipe. Had to cook the cakes for approx 10 mins longer. I froze the cakes for a week before the party and defrosted the morning of and cut each cake in half. I iced them and then left the cake out until served. Best chocolate cake I’ve ever eaten! 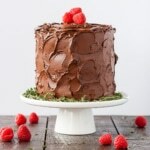 I’m getting ready to make this cake soon! I don’t have cream of tartar, can I leave it out? I do habe meringue powder, could I use that somehow? Hi Linda! The cream of tartar is not critical, it just helps the meringue whip, but I often don’t use it. I’ve never tried using meringue powder and not sure if I would sub that in. Hi Olivia. I made the cake and it was very quick to rise but by the end, it caved in and sunk in the middle. I made a second round to try it again but same result. What could be going wrong? Hi Liz! Did you make any adjustments to the recipe? Or are you at high altitude by chance? Hi there! I want to try this recipe but scaled up to serve about 40 people. I was thinking 10 inch rounds with 3-4 layers. Can you advise how to scale up the recipe? Thanks! Hi Olivia, I’ve spent this evening reading several of your blog entries. 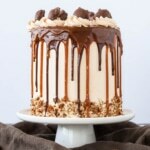 I appreciate how helpful and honest you are in your blog posts and that you also include a slice of the cake in your photos. I am an experienced baker but fancy, multi-tiered cakes are not my thing. But your recipes inspire me so I’ll give it a go. Keep on being inspired. I used to have a blog from 2005-2017 but I am now retired. Hi Lori! You are too sweet, thank you!! And wow that is a long blogging career! Is the blog still up? I’d love to check it out. Hi Christine! Yes, the discs can be made in advance no problem. A nutella SMBC would be delicious! Though it would be on the softer side for sure. How long do you plan to have the cake out? I would definitely refrigerate it before you plan to have it sit out. Just made this with a few modifications, I used a swiss buttercream with nutella and a ganche…used you cake and meringue recipes. Turned out fabulous! So glad you liked it Sue! I made this cake last week and the taste was absolutely amazing! I followed this recipe.. didn’t use the hazelnut flour however added more plain. Hi Natalie! Strange that it didn’t rise, this cake should rise a LOT. Have you checked to make sure your baking powder/soda are not expired? Hi. Even mine dint rise too. I used yoghurt for buttermilk. Would that be okay? Hi Varsha! No, you should use buttermilk per the recipe. Hi, I found your recipe after trying out a different one. I’m struggling with the meringue discs. The recipe I was using said 200F for 90 minutes. That basically did nothing to the meringues. I cranked up the oven to 250F and after 90 minutes, they seemed right. But now after cooling, they’re like lightweight stones if that makes any sense. Very crisp. Did I overtake? Hi Lindsey! The meringues should be dry and crisp, but very light. Sounds like they maybe baked ok? Also, some ovens run cool/hot — might be good to test yours to see if its running on the cooler side. I hope that helps! So glad you and your friend liked it! Emily I’m about to make it. How much did you reduce the hazelnut meal by? Is cream of tartar necessary for the hazelnut meringue? HI Afreen! It’s not critical. It can help the whites whip up, but I often don’t use it. I usually don’t post on any site, purely out of laziness. But, this recipe was such a hit for my sister in law’s engagement party I just had to give you the feedback. The mirengue was the main key ingredient and the moisture of the cake. I made Swiss meringue buttercream and added half a jar of Nutella and it wasn’t too sweet at all. It was perfect. I need to make a cake for the wedding now and im so confused!! You have so many delicious recipes. Hi Gizem! I am honored that you decided to post your feedback!! I’m so happy this cake was a hit 🙂 Let me know what you decide for the wedding cake! Are there particular flavours you’re looking for? Probably another chocolate cake but with a white buttercream so it’s a bit more “wedding-like”. I made this cake and it was a hit. Thank you! Hi glad to have found this recipe..j want to make it next week.kindly help.me.. Chopped hazelnuts will.gv better flavour or meringue? I need to serve it on wedneaday when can i bake and keel it ready? Tuesday or wednesday? As i have heard chocolate cakes taste better the next day. And my family isnt a big fan of nutella and butter cream can i substitute with whipped ganache? Lastly does the cake harden as its in tbe fridge? I just made this for my hubby’s birthday…I had to trim the sponges because I didn’t have three identical tins which meant the frosting didn’t have a nice finish abut this afternoon I’ll cover it with a chocolate topping (choc/sugar/butter/milk melted) to hide the imperfections. All elements taste amazing so far. I did put some frosting to bind meringue and the next sponge layer. I used the coffee instead of hot water and also a little less sugar and it tasted amazing. Excited to cut it tonight! Yay! So happy to hear that Mel. I hope you guys liked it! Hi, I love all your beautiful cakes. And this one is very elegant. 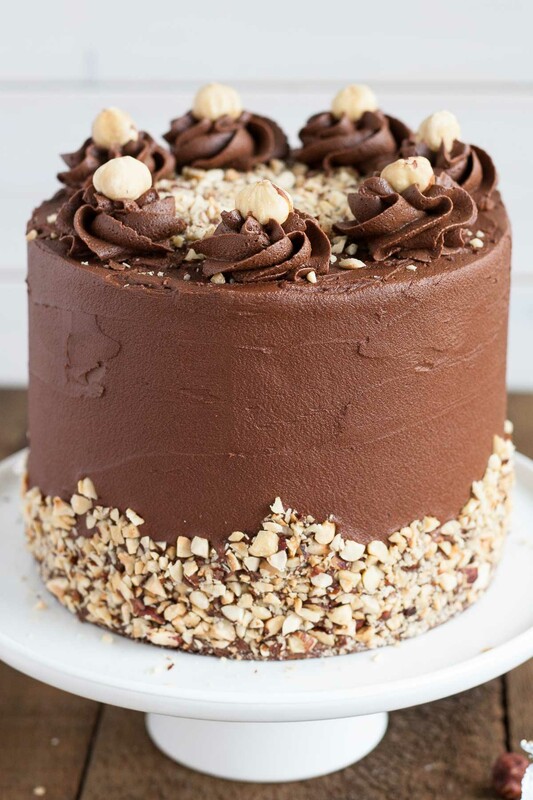 I am making a birthday cake for my grandson’s 20th birthday next month and he loves Nutella but I am wondering if you can make this cake with the Swiss Meringue Buttercream if so how much of the hazelnuts or Nutella would you add and when would you add it while mixing? I like the idea of the meringue in the middle of the layers would give a wonderful texture. So glad I came upon your blog I love to bake and just learning to really decorate cakes. Thank you for all the wonderful recipes will be trying many more. Seems I have a birthday every month for the next 4 months. Hi Debbie! You can totally make this as a Swiss Meringue, but the frosting will be much lighter in color. I just made a Swiss meringue today, but with peanut butter. I made a large batch using 6 egg whites and used 3/4 cup of peanut butter. I would do the same for Nutella, but maybe start with 1/2 cup since it’s thinner than pb. Check the consistency and flavour before adding more. As for when to add it, I would add it at the end after the buttercream has come together. I hope that helps!! I have a question : i don’t understand where the meringue is supposed to be : is it a layer of cake, then a layer of frosting, than a layer of meringue or something else ? Hi Malika! Yes exactly, cake -> frosting -> meringue -> repeat. You can add a bit of frosting on top of the meringue disc to help the next layer stick. I hope that helps! Let me know how it turns out. This cakes looks yummy. 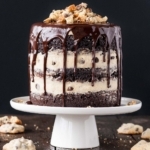 It’s my birthday on the 20th January and I am going to be very adventurous by making this cake for my birthday.I love experimenting with baking and cooking. I’ve invited about 25 friends so will give feedback on the results. Hi Garreth! Oh man, 25 people, no pressure! I hope you (all) love it as much as I do. Happy early birthday! 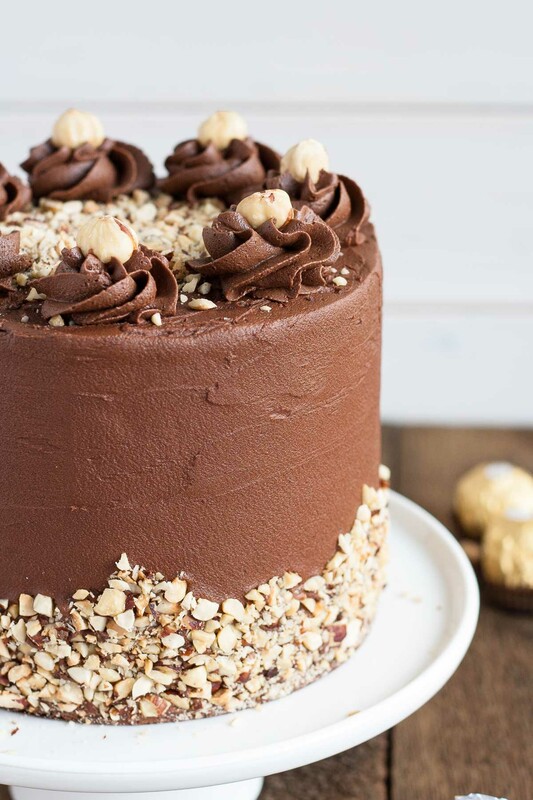 What I love about this cake, besides the fact that it is absolutely gorgeous, is that there is not even one actual Ferrero Rocher candy on it! That makes it classsy, I’ve seen many versions of this cake with the candy on it, which I don’t understand, it’s like defining a word by using the same word in your definition. Your version is creative and artistic. I would like to have a bakery make this cake for me as I’m not a baker, and hopefully they get it right! Thanks for sharing your brilliance! I really want to make this cake for my friends birthday, little worried tho as I have never made sometbing this fancy/ complicated. Looks AMAZING tho and I know he would love it! You can do it!! Let me know how it turns out 🙂 Good luck! Can’t wait to make this cake tomorrow for our Christmas potluck! I’ve never made meringue before so I’m hoping it turns out! Thank you! It turned out awesome! Everyone loved it 🙂 It was delicious AND looked so pretty! LOVE this cake BUT need to make it in an 11inch square tin (for 50 people) for a 50th birthday party. Do you think if I doubled the recipe, it would be enough? It’s doing my head in trying to figure it out. Any suggestions? I would still like to do the 3 layers but in a square 11 inch tin. I guess my friend is insisting on square for ease of cutting purposes for 50 people. Anyway, if you could offer any help it would be really appreciated. Do you think doubling the recipe would be ok? Could you please help me figure it out? Hi Lisa! I’m really not sure, to be honest. That’s quite an increase in size. 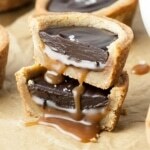 Using the info from the link above I would do one full recipe PER layer. Even then your layers will be a bit thinner, but that’s the best I can recommend. Let me know how it turns out! Hey Liv – every time I make this cake (and that’s at least 4 times now), the cake layers bake with a dip in the center, whether or not I use the soaked strips for flat top cakes. Any tips? I just tried doubling the recipe and making a 3-layer 8″ cake. They baked more slowly so I increased the temp to 375 and baked them longer, but got some pretty significant dips in the middle. I opened the oven once after 35 minutes to check on them. Both my baking soda and baking powder are relatively fresh, but maybe I shouldn’t have doubled those ingredients? Hi JK! I’ve doubled this recipe before without issue. If your ingredients are fresh and you’re baking them for enough time, that is bizarre! Are they sinking while baking or once you take them out of the oven? I made this for my birthday this past week!! It was incredible!! So moist and the meringue in the middle added amazing crunch! Sooooo good!! Thank you for the amazing recipe! This recipe is awesome, I’ve recommended it to a whole bunch of my friends who enjoyed it. The only thing I did differently is to give it a Brazilian twist. I made a brigadiero frosting (2 tbs of butter melted mixed with 3 heaping tbs of dutch press cocoa, and finally a can of condensed milk… cook it until it’s thick). Super great recipe! Can’t wait to make more cakes from your site! Can you make the meringue a few days ahead of time? If so, how would you store it? Can’t wait to make it. Hi! Sorry for the delayed reply. Yes! You can make it in advance, just store it in an airtight container and separate the pieces with parchment. This recipe is AMAZING! thanks so much for sharing 🙂 Do you know how many cupcakes one batch makes? Hi CJ! Hmm, I’m actually not totally sure. If I had to guess maybe around 18 or so? Can I use just regular cocoa powder, instead of the Dutch-processed cocoa? Hi Vivianna! Yes, you can use regular. It will change the flavour and color slightly but should be fine. Just finished baking this cake for Father’s Day! We loved it and it was also my first time baking a cake. Just a question though on how thick the meringue was supposed to be? I can barely see it in your pictures so I’m not sure if I made mine correctly. It also caused my cake to not stick together because of it. Hi Andrea! The meringue kinda gets lost in my layers due to the color :\ It’s not super thick though, like half an inch or so? Mostly there for texture. How do you mean it cause the cake not to stick together? Olivia, you are the best! Thanks for coming to my rescue. I’ll definitely let you know how it goes. I made the cake for my daughter’s graduation party and it turned out pretty nice! It was a double tiered cakes so I had to bake two 10″ cakes and two 8″ inch cakes. I ended up using the meringue in between the layers and even though it wasn’t churchy anymore, it still gave it some texture. I also added a bit of hazelnut pralines to add crunch. I had a bit of trouble with the frosting, it was too thick and hard to spread, but I never give up, so even though it took me two days to figure it out, I managed to cover the whole cake and hide some imperfections with decoration. The cake was a huge success – not only was it beautiful but also delicious! Thanks, Olivia, for your support and your creative ideas! I wish I could post a picture of the cake, but I do not know how. Yay! So glad it worked out!! Next time, you can add some cream or milk to thin out the frosting if you find it too thick 🙂 Email me a pic! I’d love to see it: livforcakeblog [at] gmail [dot] com. Hello Olivia, I just stumbled upon your gorgeous recipes while looking for a chocolate cake recipe for my daughter’s graduation. 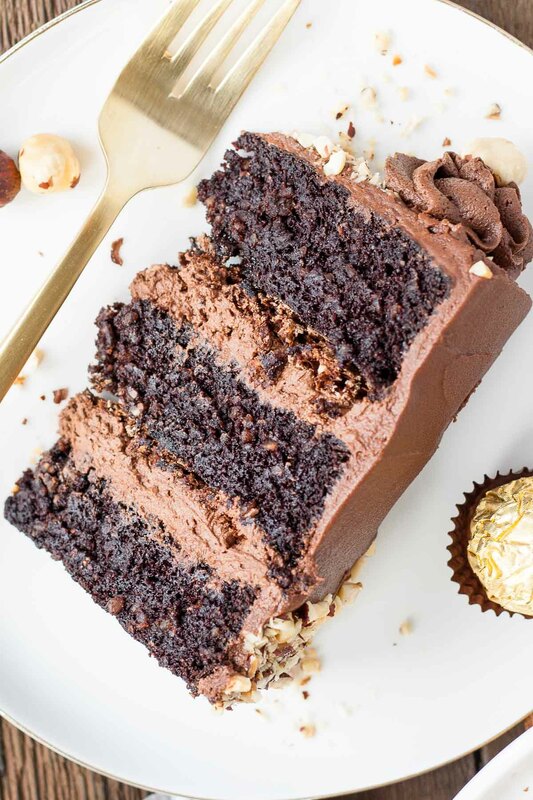 This is delicious-looking Ferrero Rocher cake the winner! My question is – on the photo it seems there are tiny bits of nuts in the batter? What are those? Hazelnut pieces maybe? But when I read the recipe, there are no hazelnut pieces in the cake and you state that the hazelnut flour should be finely ground. I’d love to have some of those crispy looking nuts in there, so pease let me know how to do that. Thank you! Hi Krisz! 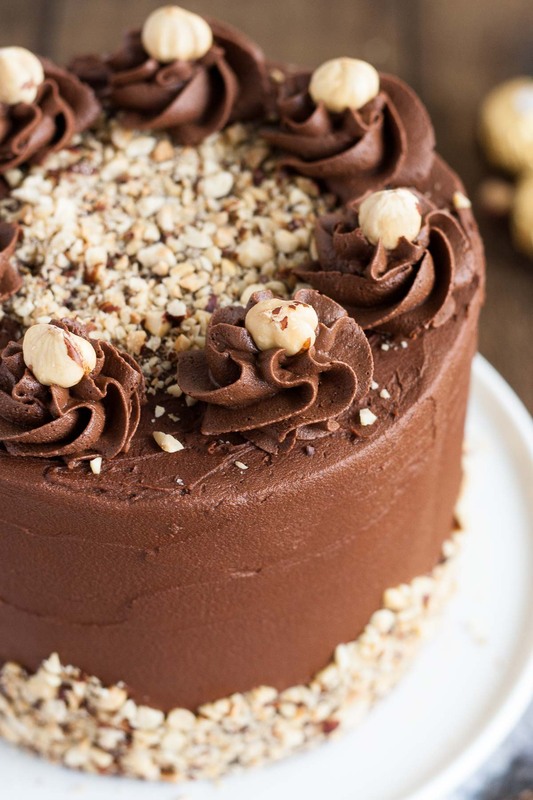 The nuts in the cake are due to the hazelnut flour. I guess I didn’t get mine perfectly fine! Or at least not all of it 🙂 They weren’t really crunchy though, but the meringue layer helped with that 🙂 I hope you like this one! Olivia, thank you for answering my question. You mention that the meringue will lose its crunch with time. I was planning to make this cake on Friday and serve it on Sunday. So I bet the meringue’s crunch will be completely gone. Do yon still recommend I do it with meringue? Also, will the cake still taste good if I make it two days ahead of time? The cake will be fine 2 days ahead of time. Just keep it in the fridge and bring to room temperature (2-3 hours) before serving. Olivia, you are going to hate me for so many questions. Last one, I promise. Initially I was planning to make this into a three tier cake and cut each tier horizontally in half to add the meringue. The first tier is in the oven already but now I’m thinking that I might not be able to cut it in half since you said it’s pretty fudgy. What do you think?Any recommendations??? I am so stressed out, I want this to work. Thank you so much for all your help! No problem at all! Happy to help 🙂 I do remember this cake being very dense and fudgy, though maybe I under-baked it! Haha. It probably had something to do with the hazlenut flour though. What I would do, is cool the cakes completely and even refrigerate them so they are more firm and hopefully easier to cut? I find working with chilled cake layers a bit easier. The layers aren’t super tall though, so I think that’s more where the cutting issue might come in. If that makes sense. I would see how they are when they come out of the pans 🙂 Let me know!! Oh also, you could always *try* to cut one of the layers in half and if it’s not going well, just abort! I would like to bake this cake but I am struggling with the cup to gram conversions. Are you able to help? You select from the ingredients along the right side first and then convert each one. I hope that helps! I’d like to make this cake but I’m struggling with the cup to grams conversion. Are you able to help? Hi Arica! I’m so happy to hear that you liked this 😊 The meringue layers are my fave too! Hi Zara! I don’t have the measurements in cups, but you can find some conversion websites online. I’ve used this one before and find it works well but make sure to convert each specific ingredient individually. I am so so sorry! Lools like i skipped a comment where you already said a day ahead is fine! This looks great and i would like to bake it for my husband. Can i make it a day ahead? grinding up 3/4 cup of hazelnuts would yield less than 3/4 cup of flour wouldn’t it? I’m thinking more like double the amount of nuts to make 3/4 cup of flour??? Hi Jackie! Good catch, I ground up 1 cup of hazelnuts. I’ve updated the recipe notes! Hey. One more question. I’m in the process of making this. I made 2 8″ layers because I need it for 12 people. I made 2 meringue layers (that turned out AMAZING!!!) without thinking about the fact the I only have 2 cake layers. Do you think it would be OK if I put both meringue layers with some butter cream between the 2 cake layers? Almost making it a 3 layer cake? They are actually a perfect fit for the cake layers. Hi Jackie! Yep, I think that would totally work. I would put a bit of buttercream between the layers of meringue to help even them out/stick them together. Or just place them flat side together w/o buttercream in between actually. They’re likely to stay a bit crispier that way. Let me know how the cake turns out! Can you make this a day before if so does it need to be stored in the fridge? Hi Darlene! Yes, you can make it the day before and store it in the fridge. Take it out 2-3 hours before serving. If I don’t have the hazelnut flour , can I substitute it with what? Hi Doaa! You can substitute all-purpose flour, so use 1 1/2 cups total. This looks amazing! 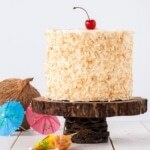 What type of texture is the cake? Do you think that it would be strong enough to put under fondant and not collapse like a mud cake? Thankyou!! Hi Amy! This is a dense and fudgy cake, and very moist. I think it should be ok under fondant. Are the merengue the ones on the cakes with the nut Inside or is it just frosting and the meringue is Spread on top? Hi Sharon! I’m not sure I understand your question. There are meringue layers and frosting layers. Such a divine recipe. I can’t wait to make it for my partner’s 30th birthday! We have about 30-40 people to feed and I have some 9″ cake tins. Could I double the recipe and use 2 tins or should I use 3 tins? Also, how would you adjust the cooking time if I double the recipe? Thanks in advance from Australia! I tried the recipe using 3×9″ cake tins and 2×9″ cake tins as I was getting to know my oven (I don’t bake much!). I have a conventional oven with heating element at the bottom – it doesn’t seem to do so well using multiple racks. Hope you had a lovely Christmans! Hi Karen! My cakes were fairly moist too, but I like them fudgy, especially for this recipe. Let me know how it turns out! Hi Zehnab! I get them at local organic or specialty stores here, but you can also find them on Amazon. Hi Terri! The acidity in the buttermilk helps activate the baking soda. With regular milk, the cake may not rise. I don’t understand where the meringue is? The rosettes look like icing. You said something about putting them between the layers?? I made a cake almost identical to this a few Christmas’s ago from Gretchen’s Bakery. She topped her’s with the actual Ferrero Rocher candies with a chocolate ganache center. It came out great. I think I just gained a few pounds thinking about it. Hi Catherine, the rosettes are icing. The meringue is in disc between the layers as the post details. It’s hard to see because it’s chocolate and blends in with the cake and frosting but it’s there! Hi Olivia! This is an absolutely stunning cake. I would definitely try making it for my husband’s birthday. I have one question,though. 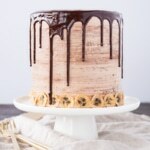 Can the cake layers be baked a day or two in advance? Hi! Can you make this with two 9 inch rounds instead of three 6 inch rounds? Hi Sara! You can — the layers might be a bit thinner though. Thanks! How much would you adjust the baking time for? I would peek at them 20mins in and if they still look pretty liquid then start checking at 25mins. Great job on this, it makes my mouth water just looking at it. Looks so delicious. I’m going to try this over Christmas, or maybe for my birthday in December. I’ll be 41! Happy birthday! And I’m so glad you decided to make a cake for your party, at least 😊 This cake looks gorgeous! And I love Ferrero’s, so I’m definitely going to try this. I love the meringue layers, too. Can you use non-dutch/regular cocoa powder? First of all Happy Birthday! I agree with you – time flies. I was thinking the same today. Can’t believe it’s November. I always wonder how come the time did not fly when I was a teenager – especially in school! Haha. Your cake looks beautiful! As a kid I loved Ferrero! The cake is gorgeous as usual. I love the meringue in between layers. This definitely makes the list for holiday baking! 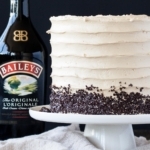 Love the addition of the hazelnut flour and the meringue to this cake!! Huge fan of contrasting textures. I am not a nutella fan either. Sounds like you had just the birthday celebration you needed. Wishing you many more happy years! another stunner! Happy Birthday! I love that you celebrated with pie. and i know what you mean about the time slipping by…this year is officially passing at lightning speed. and don’t fret about 40…it keeps getting better! If I want to make it but I want in 8 inch cake pan what I have to do ? Hi Fatema! For most of my cake recipes, you can make them in either three 6″ pans or two 8″ pans.